The perfect glazing alternative for any greenhouse publication, translates its many unique features into cost saving benefits. Features a proprietary surface treatment which provides resistance against degradation caused by UV radiation in sunlight. Carries a Ten Year Limited Warranty* against discoloration, loss of light transmission and/or loss of strength due to weathering. Most thickness available in Clear, Opal, or Bronze. 4' & 6' Widths are standard sizes. 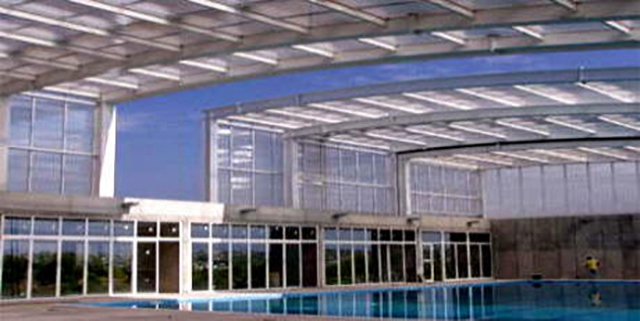 Multi-wall polycarbonate twin wall sheet produced in 4mm, 6mm, 8 mm and 10 mm. These products provide high light transmission, good thermal insulation, high temperature resistance, high impact strength (hail resistance) and can have our min-dew coating which eliminates condensation and water droplets. 6mm Twinwall Polycarbonate: 6mm Clear TwinWall Polycarbonate is the R-value 1.62, U factor 0.616, 80% light transmission (Clear), 25% light transmission with Bronze. 60% light transmission with Opal. 8mm Clear TwinWall Polycarbonate:is the R-value 1.79, U factor 0.560, 80% light transmission (Clear), 25% light transmission with Bronze. 60% light transmission with Opal. 10mm Clear TwinWall Polycarbonate:10mm Clear TwinWall Polycarbonate is the R-value 1.79, U factor 0.560, 80% light transmission (Clear), 25% light transmission with Bronze. 60% light transmission with Opal. 16mm Clear TwinWall Polycarbonate:is the R-value 1.79, U factor 0.560, 80% light transmission (Clear), 25% light transmission with Bronze. 60% light transmission with Opal. 25mm Clear TwinWall Polycarbonate: is the R-value 1.89, U factor 0.528, 75% light transmission (Clear), 23% light transmission with Bronze. 60% light transmission with Opal.